DT FROSTYS POCO GIRL - Really nice dun mare, she has been started in the round pen, saddled and ponied, does not buck when saddled. I have not gotten on her due to the fact that I was pregnant all last summer. 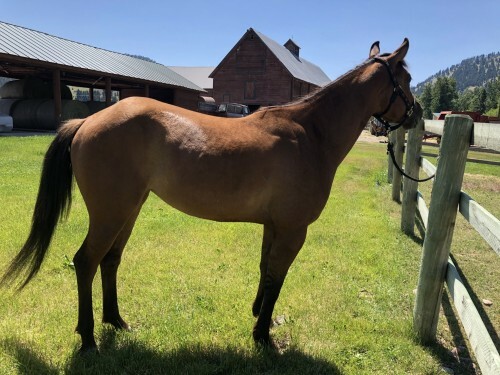 She is extremely athletic and gritty, knows how to use her hind end and has a lot of speed. Her stallion was an outstanding ranch horse, go anywhere and do anything. I think she would excel in any area, she wants to work and learns quickly. She bathes, loads, ties, trims, current on vaccinations, deworming, and trimming. Relocating to Oklahoma and need to downsize. Call for more info (406)-577-6142.